An Australian father and his two sons have been found alive after going missing for 11 days in the outback. 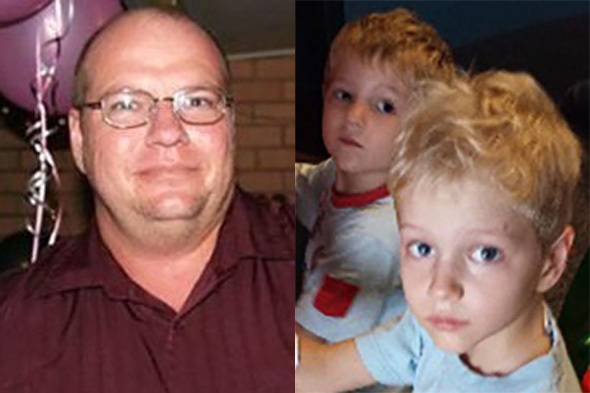 Steven Van Lonkhuyzen, 37, and his sons Ethan, seven, and Timothy, five, were found by a farmer in Expedition National Park, Queensland. When the farmer went to look for them after seeing media reports of a missing family, he discovered their car stuck in a bog, 9News reports. Police said the family became stranded in the national park when their car got bogged and were found "very hungry". Acting Superintendent Mick Bianchi told ABC that police conducted extensive searches over several days. He said: "We've had farmers and graziers searching their properties, local store owners checking to see if they had passed by or dropped in, mining companies and mustering helicopters checking lands, as well as park rangers searching parks and camp sites. "We are all very thankful that we have a happy outcome." The trio left their home in Cairns on 11 December and were supposed to return on 15 December. Steven contacted his wife the day they left but did not hear from them again. When they were found, the farmer took them back to his house to recover. Broome in Kimberley, north-western Australia, is one of the most remote towns in the world but once you’re there, you will be rewarded with a beautiful natural phenomenon. The Staircase to the Moon is an optical illusion that occurs when the full moon casts its reflection off exposed mudflats during low tide, creating the impression of a golden staircase. This remarkable rarity occurs just three nights each month between March and October. The mercury can hit as high as 47 degrees in Coober Pedy, the largest opal mining area in the world. This exhausting heat is why most residents in this South Australian Outback town live underground in dugout-style homes. Visitors can experience this unique way of living by staying at the Desert Cave Hotel, which has 19 underground rooms built into the sandstone and, as a result, gleam a glittery gold. For more underground hotels, see this selection from Flight Centre. Nullarbor Links, the world’s longest golf course, took five years to build, covers two states, takes four days to complete and was dreamed up over a couple of beers. The 18-hole golf course spans a whopping 848 miles from Ceduna in South Australia to Kalgoorlie in Western Australia. There are nearly 50 miles between some holes which can be found along Mile Straight, the most famous stretch of dead-straight road in Australia, and a selection of motels, petrol stations and wombat holes. Forget bring your own booze – Sydney’s diners bring their own crab. Malacca Straits on Broadway is a Malaysian restaurant located in Ultimo, an inner-city suburb close to the Sydney Fish Markets. For $20, Chef Tan will return your crab dressed in a Singapore chilli sauce or Kam Heong. It’s not first date food but at least you know it’s fresh. For the ultimate overnight experience, head to the Whitsundays and spend a night on the Great Barrier Reef. Reefsleep’s luxury pontoons are permanently moored at Hardy Reef, 40 nautical miles from the coast. The only overnight option on the world's largest coral reef offers a package that includes snorkelling, semi-sub rides and night-time diving. Lake Lefroy, a hard and huge dazzling salt plain in the south west of the country, is the perfect spot for the unusual sport of land sailing. Land yachts have three wheels and a seat for the driver who controls his vessel with nothing other than foot controls and a hand-held rope. The flat, open space invites strong winds that will send you flying along at speeds of up to 100 km per hour. Tiny Tasmania is regularly overlooked by the bold attractions of Australia’s mainland but it’s been busy racking up cool credentials in recent years. The creative Avalon City Retreat is a 17-metre glass pod that was lifted by crane in a single block to crown a nine-storey office block. The two bedrooms sit at opposite ends of the sleek capsule and, needless to say, the views of Hobart are quite spectacular. Australians like to compare their Running of the Sheep in Boorowa, a Irish settler town close to Canberra, to Pamplona’s Running of the Bulls (we assume in jest). Every October, farm dogs shepherd a large flock of sheep along Boorowa’s main street and, following the flock, is a street parade consisting of Irish dancers, floats and a fashion parade where humans model woolen clothes. Grove Hill Heritage Hotel, which looks a little like a tin shed, sits in an old gold mining locality in the Northern Territory and was built in 1934 from the materials found at abandoned mining sites. It’s as basic as a hotel can be, but on the last Saturday of every month it puts on a free barbeque and live music for the town and its guests. Price: From £78 per night. Wilpena Pound, a natural amphitheatre that looks like a meteorite crater, is believed to be an incredible 800 million years old. The mountain range sits in the Outback’s dusty Flinders Ranges National Park, a six hour drive from Adelaide. Visitors can camp at the foot of its majestic walls in the Ikara Safari Camp, a cluster of 15 high-end safari tents. Start your day with a scenic flight over the pound, just as the sun rises, and see her in all her glory.